II‘ve had no plans for this one at all. 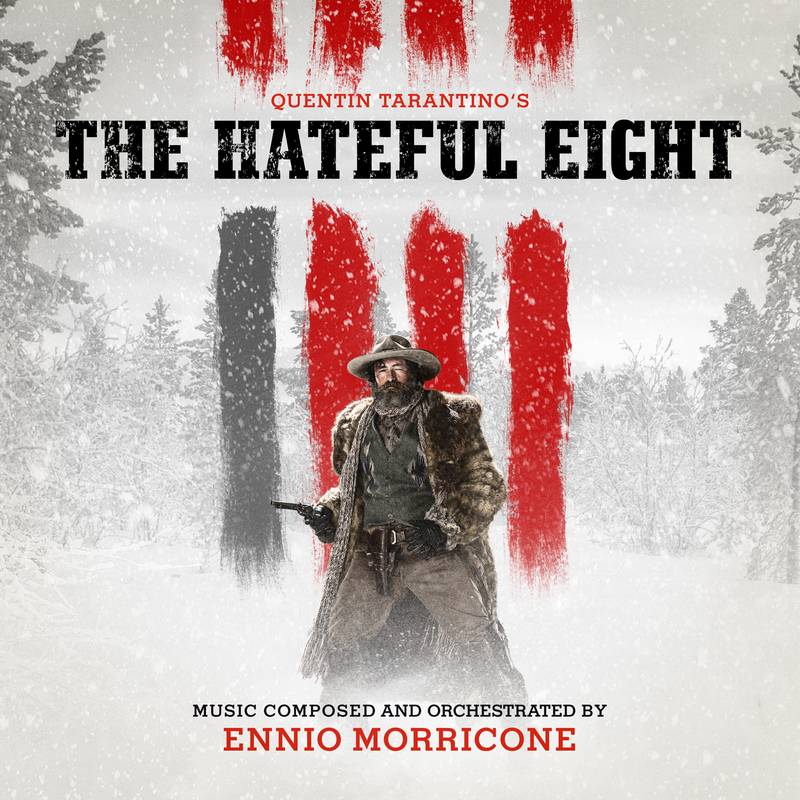 But with The Revenant under my belt I just couldn’t let go of the other snowbound epic from this years winter season. 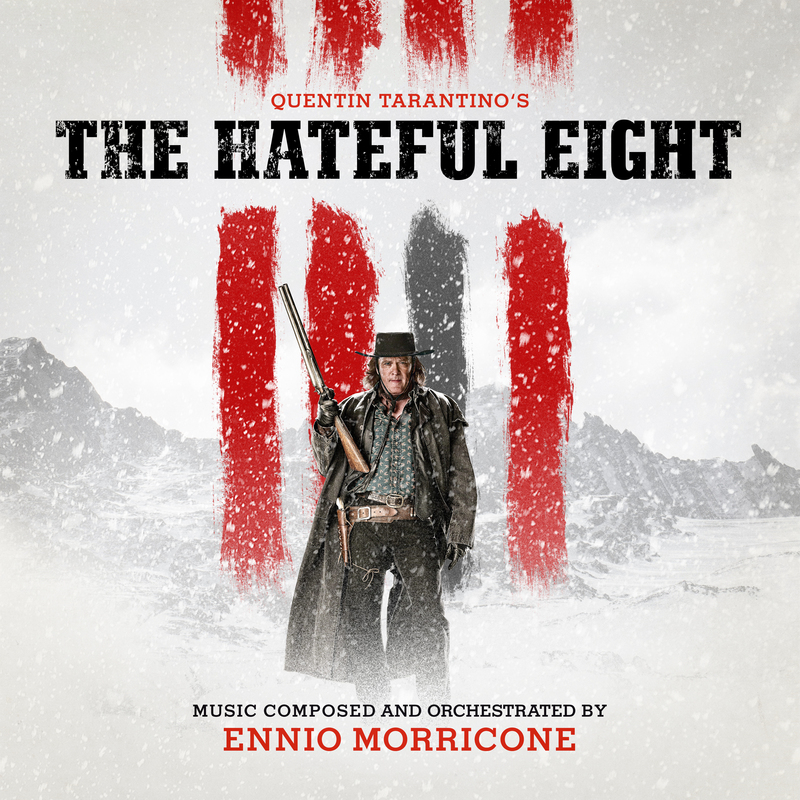 Also it’s a brand-new Ennio Morricone score and you don’t say no to such a thing, do you!? Without any intention of deliberate puns, I’d like to start off this entry with a little warm up round. My remake of the original artwork (#1) was an obvious matter for various reasons. But mainly for the illegible composer’s credits. 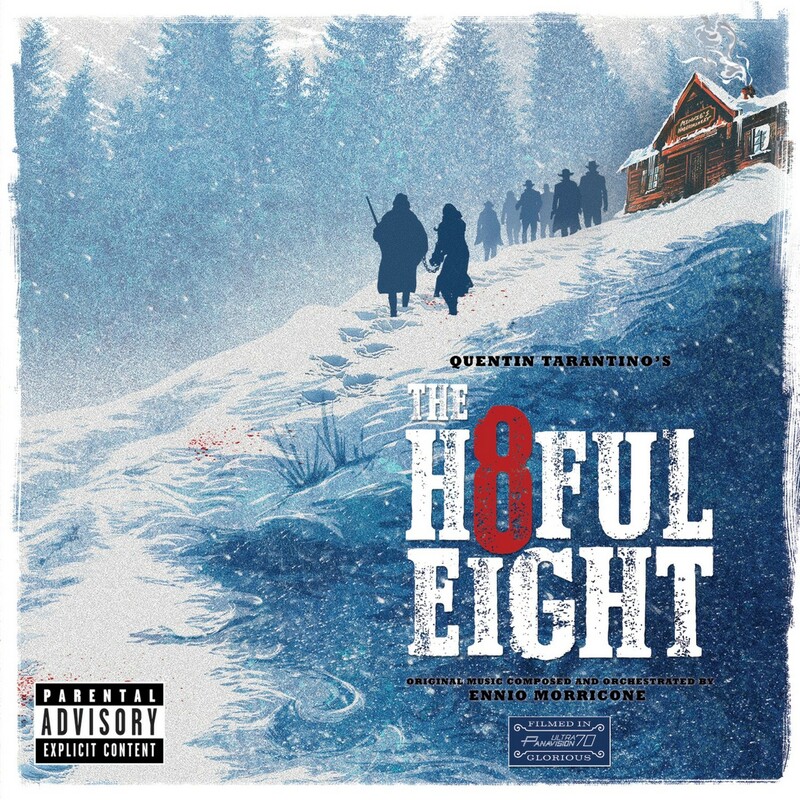 The commercial release jacket for Hateful Eight makes some odd choices — unnecessary artwork cropping, dark text on dark background, irrelevant information… all things I’ve endeavored to fix up including omitting the parental advisory label. The image you see here is actually a combination of three different versions of the same drawing: one was portrait-oriented and low resolution; the other was landscaped and medium resolution; the third was another medium resolution source I used to excerpt vignettes for masking. I looked for better sources; however I didn’t find anything suitable and comprehensive for what I was trying to do. The recoloring was my doing — partially to enhance the atmosphere, and partially to pop the logo and its accompanying credits. 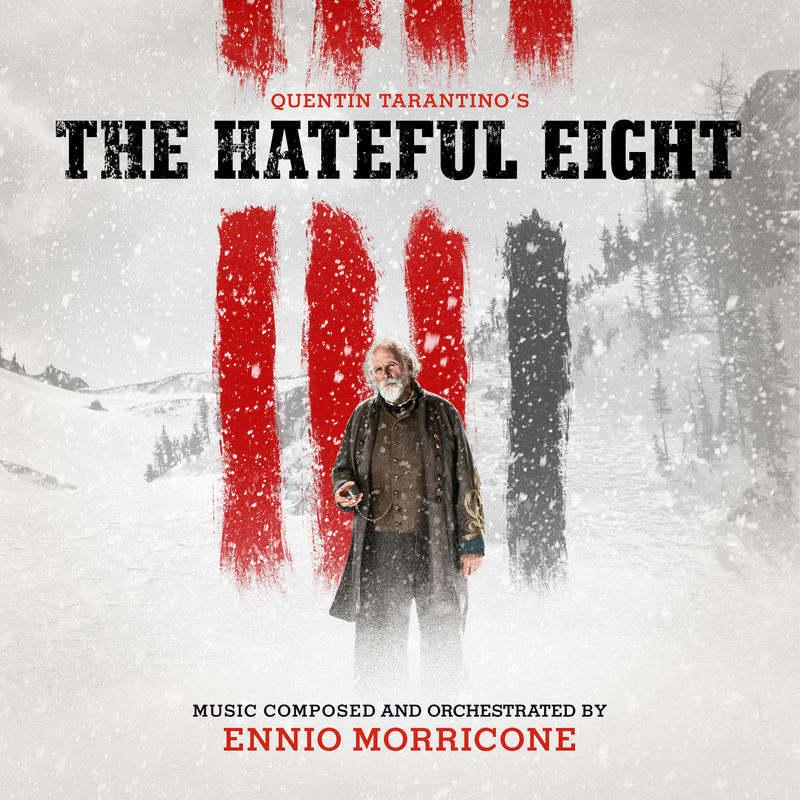 Regardless, Ennio’s name starts to get a trifle obscured by the wispy snow in the lower right-hand corner. It’s not ideal, however given the resources at hand, I managed to preserve a lot of detail while still accomplishing my compositional objective to preserve the full scope and depth of the artwork in a square aspect ratio. I really prefer his design over the official one. 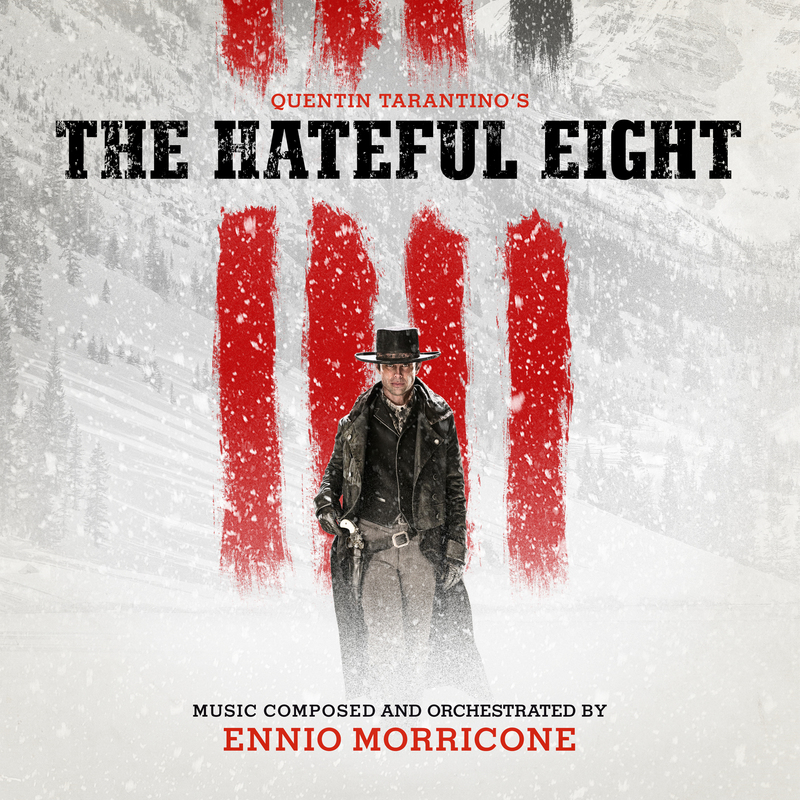 Just like the 70mm Roadshow version of the movie, it provides a wider and much more atmospheric image, resulting in a wonderfully sinister and almost stage-like forest scenery in the background. 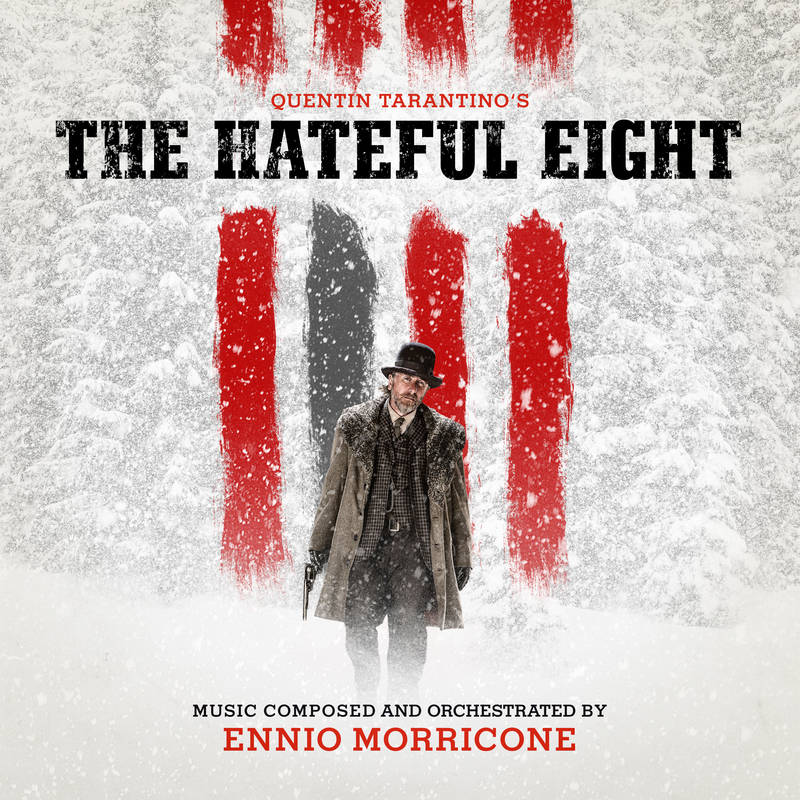 Thanks to the smaller logo and album credits this one could pass as a vinyl counterpart to the official soundtrack CD. And to be honest, it should have been exactly that, because Third Man Records’ official vinyl edition (#3) is a pretty boring affair, even though it came in a neatly wrapped package. 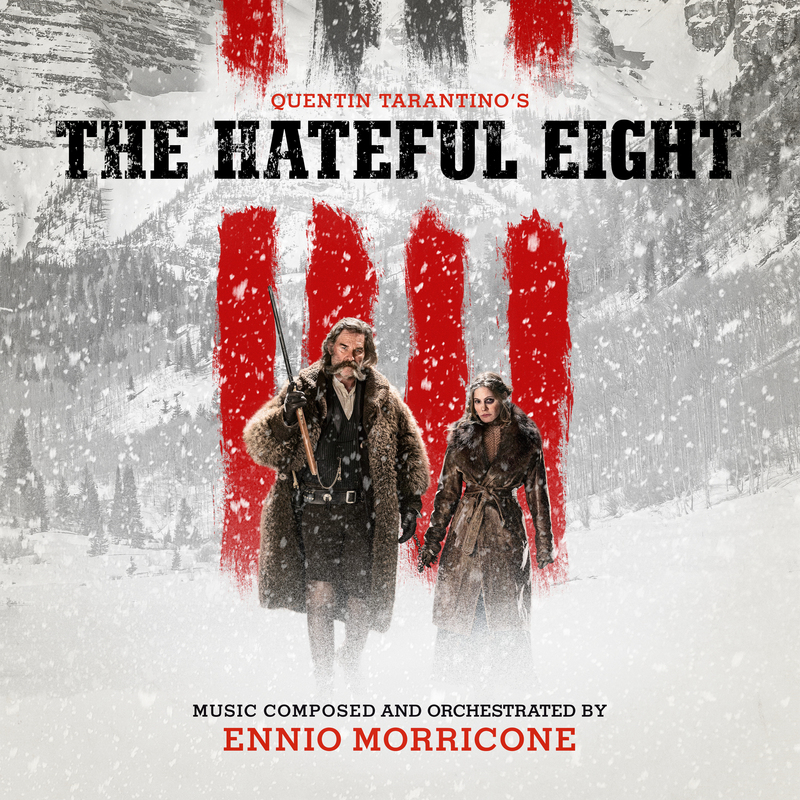 But artwork-wise they could have done better, especially for a visually striking film like The Hateful Eight. 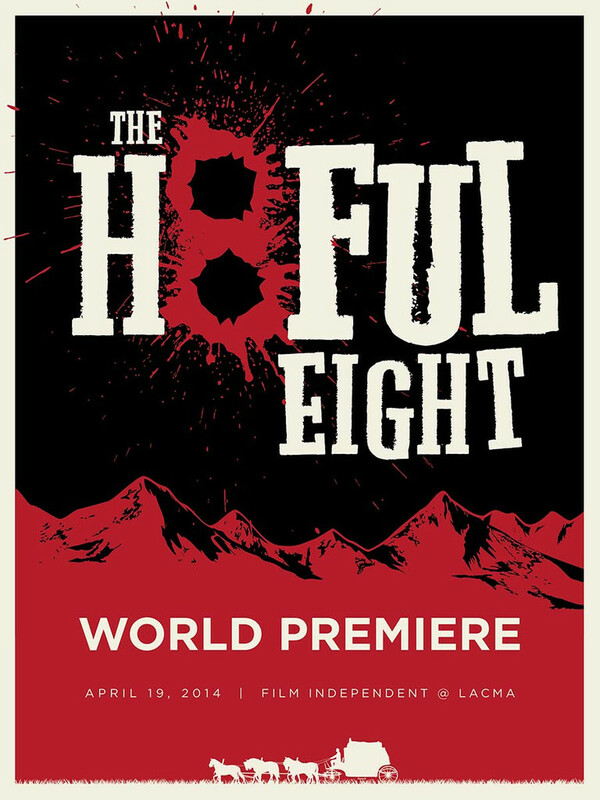 There’s been a bunch of nice posters for The Hateful Eight, including a really beautiful – albeit low resolution – teaser poster with lots of negative space. However, they leave the first stirrings of a bitter taste in my mouth. 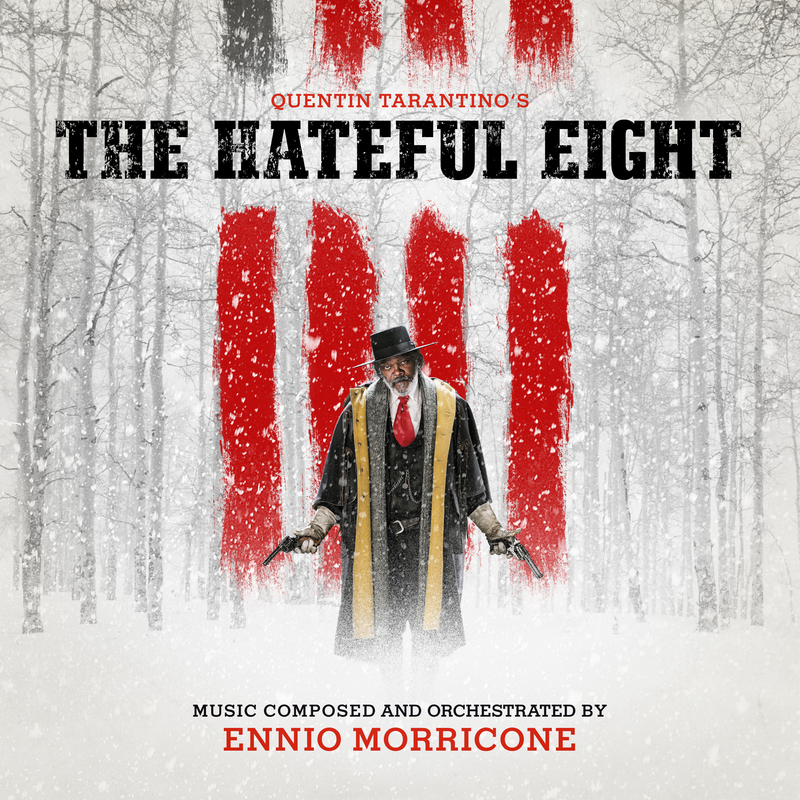 It cannot be denied that for a couple years now, Quentin Tarantino is treading water. He has apparently taken a special fancy to the blaxploitation genre and is sticking with it ever since. We also get the very same narrative structures, speakalike characters and exaggerated graphic violence in all of his latest efforts. Even the posters of his films apply the same bold, bloody, high-contrast formula again and again. And I’m starting to get tired of it. Be that as it may, the following gallery of custom covers was entirely based on official advertising material. First we have another one of Terry’s designs (#4). He enhanced the graphic approach of the LACMA world premiere poster with wind and snow particles and created a really restless, forbidding atmosphere. My sort-of opposite is a modification of the audience leaflet which was given away at the Roadshow attractions (#5). Earthy-brown colour tones ensure a warm, almost romanticizing mood. But don’t let yourself be lulled into a false sense of safety, cause we’re already back in the harsh climates of the Wyoming winter (#7, #8). Using the original font (“Stymie“) I was able to create a weather-beaten version of the film logo. Excellent! Great quality! May I ask you a question? Where do you find elements for compositions? I mean, all components like figures of actors, backgrounds, etc. Do you get it from movies screenshots? :) I’ve seen all of your covers, but can’t understand where do you get all stuff for mixing together. :) Because it is not regular photo manipulation. Sometimes it is hard to find stock photos with necessary point of view, but you even found actor’s pics and with good light. My two primary sources are CineMaterial and MovieStillsDB, there’s plenty of stuff there (although Studios recently started to delete their posters on CM). I also manipulate images to my likings, if necessary, but sometimes it’s really hard to achieve. Go check out my ‘resources’ links on the blog for more stuff.